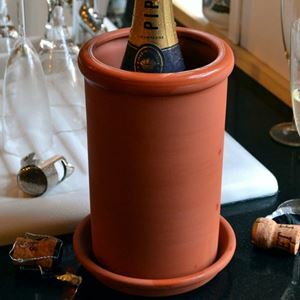 Our terracotta wine coolers are available in natural terracotta and glazed finishes. Colours available are apple green, turquoise, mushroom & oyster. The coolers are hand dipped in two glazes which melt & react in the kiln creating unique effects. 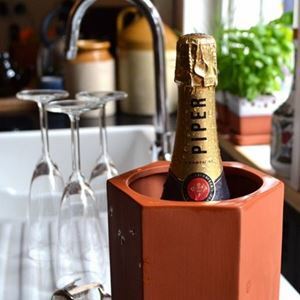 The round coolers and larger hexagonal coolers both accommodate Champagne bottles. 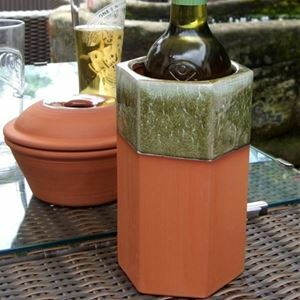 And, why not add an optional matching round or hexagonal saucer (& with either unglazed or clear-glazed) which will keep your table free from any liquid marks from the natural condensation of the wine cooler?